To the unsung heroes of the creative world: comic creators. My hat is off to the page and cover artists who sweat blood for their craft and work a magic all their own. Not to snub anyone, comics wouldn’t exist without the writers who provide the narrative and dialogue. Word-smithing has its challenges, but it is a chimera of an all- too-different color from truly skilled and inspired hero art. So, a sweeping bow to those artists who inspired me in my childhood, and made me struggle to bring involving and engaging written life to the “super” heroes (and villains) of the Ring Realms. ‘Nuff said? Welcome to the Ring Realms universe, a cosmology populated by magic, technology, gods, goddesses, and multi-verses. Comic fans will feel right at home, but fandom is not necessary to be drawn into the world’s magic and heroism. Those learned in mythology may see a name (or a score of them) that they recognize. names to the milieu—something that is one of the all-too-common pitfalls of fantasy writing. If see a name you recognize, rejoice in that knowledge because where possible I have tried to keep to the spirit of those myths whilst incorporating them into a much larger cosmology. Notice, I say ‘spirit of’—please don’t flagellate me (however much I might enjoy it) for not adhering more closely to the source myths. Liberal dramatic license has been taken in order to heighten and enrich the story…Enjoy. Reality’s Plaything Saga – The Tales of Bannor Starfist. Savant’s Blood Saga – The Tales of Wren Kergatha. Shaladen Chronicles Saga – The Tales of Corim Vale. Atop the judgment dais, Euriel Idundaughter-Kergatha struggled to break free before Hecate’s priests dragged away her seven-summer old daughter. Little blonde Liandra kicked and screamed as the baldheaded men in red tunics towed the child across the audience chamber floor. Each shriek stabbed into Euriel’s heart as they echoed off the vaulted marble ceilings and rattled the stained glass mosaics. “Mother!” Liandra implored, hands thrust toward her, blue eyes wide with panic. Euriel twisted her arms against the stone that had encased them. She wouldn’t let them take her children. Cosmodarus was a city of peace, neutral and outside the boundaries tread by the avatars. They had no right to be here; no right to take anyone away. The click of hard boots climbing the dais steps echoed through the chamber. Euriel felt a prickly-cold sensation hum through her body as someone stepped close. The air filled with a stifling musky-sweet odor; the smell of dying flowers. Euriel tore her gaze away from daughter and glared at the avatar. Only a creature corrupted with the magic of a dark pantheon lord could make her flesh crawl like this. Recognizing the night hag Mishaka, she spat at the evil creature’s feet. Hecate’s avatar was a pale knife of a woman dressed in spike heeled riding boots and layers of white silk. Her perfect face with its moon-gray eyes and broad blood-red mouth would have been attractive were not the rest of her so black and twisted. Growling, Euriel jerked her face back from the woman’s loathsome touch. She focused all her attention on the two pillars of rock pinning her arms. Mishaka had taken her by surprise. If she’d sensed her coming, this situation would be different indeed. Her heart pounded. She stole a glance toward Liandra. Her little girl was only visible as a darkened shape dwindling down the hall. She had to get to her. She concentrated all of her will on her right arm. She was Idun’s daughter. The blood of the Aesir flowed through her veins. I must be free. A red haze filled Euriel’s vision and heat surged through her. My children. My husband. My kingdom. She increased the pressure on the material gripping her arm. Euriel focused until she saw each granule of the irregular surface trembling under the force of her love and determination. Her right arm came free in a rumble of shattering stone. Mishaka’s eyes went wide and her mouth opened in a scream. She didn’t get out a sound before Euriel’s hand clamped around her throat. Fury driving her, Euriel yanked the despicable woman forward and shoved her hard into the pillar still gripping her other arm. Mishaka’s head impacted the surface with a thud. She pulled back and slammed her again. “Feel—your—folly!” She punctuated each word with a hammer blow into the rock. Mishaka only groaned and twitched. She would pay for the indignities and torture, for her gloating and overconfidence. 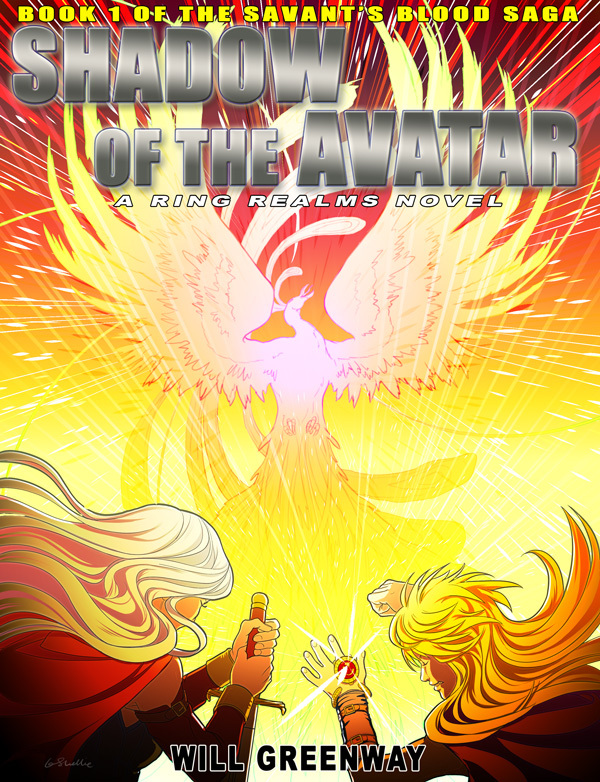 The avatar’s eyes rolled up, and blood bubbled from her lips. Justice served. A few moments longer and this evil spawn would be back in the abyss where she belonged. Pain exploded in the back of Euriel’s skull. Lights spun in her vision. The shock broke her grip on Mishaka. The avatar toppled to the floor, flopping and jerking. Before Euriel could orient, another impact drove her to her knees. The world grew fuzzy. In Wren’s fifteen summers as a Guilder, she never once got set on fire. She found the experience one she hoped never to repeat. As she topped a stone wall in an alley behind the wizard Cinnabar’s tower, the magic struck her in the back. The impact felt as if someone hit her ribs with an axe. The blast shredded the leather hauberk she wore, sending pieces of it shooting off in trails of smoke and sparks. She screamed and fell to the cobbles clutching her breasts and stomach. “Wren!” she heard Grahm yell. She focused through the pain to keep from falling unconscious. The effort made every sensory detail stand out in bold relief. An icy sea breeze guttered down the night-darkened lane, blowing scraps of parchment through skeletons of broken crates and barrels. Wren clawed at the dirty stone, the slightest movement sending shrieks of pain through her body. She had to quit the Guild. Nothing was worth hurting like this. Wren, the Brethren Guild’s premier two-story girl, had topped herself. Up a hundred paces of mirror-smooth tower wall, through a narrow window, and past all the wizard Cinnibar’s magical wards and traps. From within a secured room, behind mithril-steel walls, past an array of tricks, runes, and locks she had come away with the fifty-thousand crown Malicent gem. In this heist, she and Grahm had succeeded in breaking the much vaunted sorcerer-ring defenses that had stymied thieves for more than two centuries. The feat established their team as was one of the best infiltrators ever. How ironic to foil all that security only to get caught by the wizard himself. From a tower window, two hundred paces away, he managed to clip her with a fire spell. She may have proved her skill, but the wizard had made her pay for the privilege. Wren the thief was now Wren the living blister. Grahm shook her, wild blond hair wreathing his boyish face. His wide dark eyes and quivering lip might have looked comical some other time. Grahm dragged her up. Her skin burned as if she’d spent a day unprotected in the desert. His voice echoed behind the wall. “Found it! Coming—” His words were interrupted by a brilliant white light and a crack of thunder. He cried out in pain. The pack flew over the wall and landed near her. Grahm came after it. Another bolt of lightning smashed the top of the wall behind him. He flipped and landed by her. He snatched up the pack and yanked her toward the street. She staggered and he supported her. When she put an arm around his waist, she felt charred material and blood. “You’re hurt!” She experienced a pang as she caught a whiff of smoldering leather and flesh. “Just keep going!” He tried to conceal the pain, but his voice cracked. Guard whistles blew a few streets away. Turning east on Dragon Road they headed away from the waterfront into the warehouse district. A low mist writhed through the maze of alleys, lofts, and silos carrying the fetid odors of dead kelp, fish and excrement. Derelicts lurked in the sheltered spaces, shadowy silhouettes that leaned, crouched and sprawled. Wren’s energy ran out by the next intersection. She tripped and fell. A gust chilled her burns like the lash of a whip. She looked seaward. Half full, Pernithius, moon of the harvest, loomed behind towers of clouds advancing on the city like an army. Triatus, the russet moon, peered like a demon’s eye between gaps in the gray masses. He towed her stumbling down market aisle, weaving around broken carts and stalls, scattering spoiled vegetables and fruits left from the day’s bartering. Their pursuers broke into a jog. In a shaft of moonlight, Wren saw they weren’t city guards. She clutched his shoulder. “Those are Dagger guildsmen!” The Cult of Dagger had been disbanded three seasons ago. She thought all their members had been run out of town or slain. “I know,” he replied, turning them at a corner and heading down a narrow lane between two old tenements. The guilders reached the alley in time to see them turn. Grahm rushed south on Caravan Street where a dozen streets and alleys branched off into darkness. He pulled her behind the cover of some stairs and paused to let Wren catch her breath. Her mind whirled both with the pain and revelation. The presence of the Dagger guild meant trouble. If they were back in the city it could mean only one thing. “Have they come to make war on the Brethren?” she asked. “Damned witch is wrong about far too many things.” She gritted her teeth. Creeping along the wall they used the stairs to cover them. The Dagger guilders had spread out, making a sweep of possible escape routes. Grahm and she could slip them. They knew the city better than anyone in the Brethren guild. Tarmagal and Vulcindra, Desiray’s seconds didn’t even grow up in Corwin. Both knew little of real thieves’ business save administration. At least Tarmagal could fight, put a sword in her hand and she fought like the devil. Even she would be better than Vulcindra and her lack of organization. She still didn’t know why Desiray let that incompetent run things, she was little more than a pretty decoration.